A TARDIS throw blanket! *homina* As Dr. Who fans, this is going to the top of our wishlist. It's one of those really warm, really fuzzy, comfy throw blankets that are awesome for cuddling up on the couch in the winter with some warm tea. Yes ladies, you get to go inside the TARDIS with the Doctor. It's not a sleeping bag which is one thing we kind of wish for. But ah well, this blanket is big and comfy - although we're not sure if it really is bigger underneath the blanket. For those not familiar with Dr. Who, but have people in their lives that love it - this thing is awesome. See the TARDIS is the ... craft? ship? police box? that Dr. Who uses to get around through time and space. TARDIS is an acronym that stands for "Time And Relative Dimension In Space". The TARDIS has been a constant, er... companion of the Doctor throughout all of his travels. IT's an iconic symbol of the Doctor, perhaps even moreso than his trusty and famous Sonic Screwdriver. 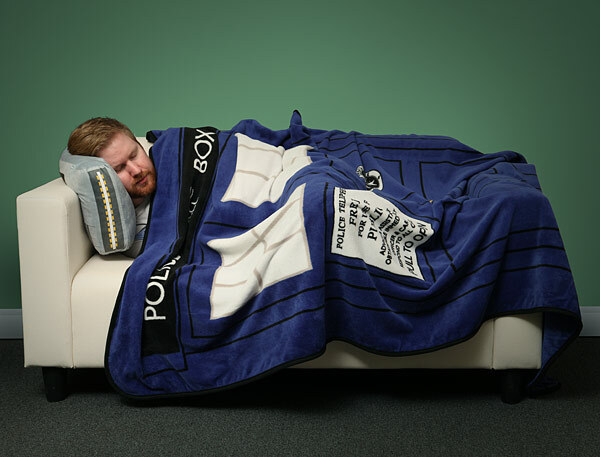 This blanket will make you wish that the Doctor would whisper in your ear... "Run" and you take off with this blanket on an epic adventure through space and time with him. This is an officially licensed Dr. Who collectible - for those that care about the officialness of stuff.